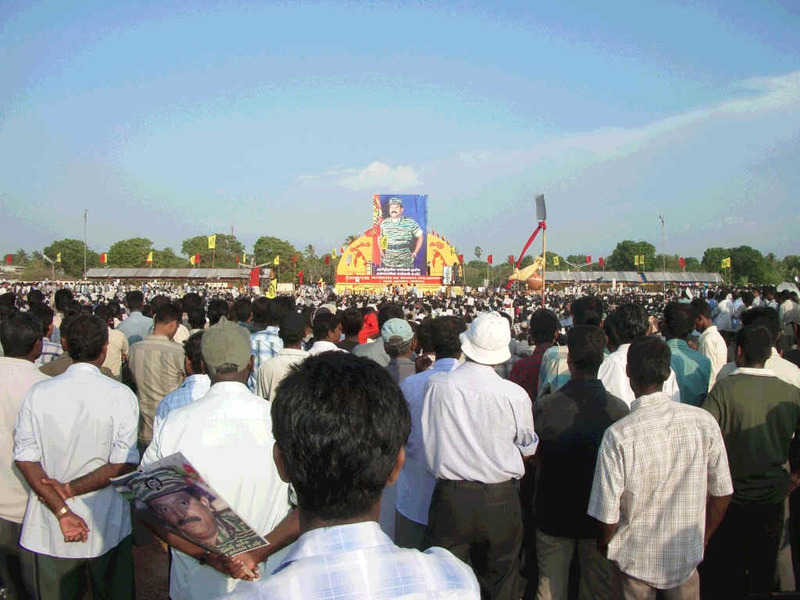 I had the greatest pleasure of visiting Jaffna on Sept. 30, 2005 to participate in the Pongu Thamil celebrations. I left Kilinochchi at 12.00 noon. When I drove through Pallai I was able to see the decorations on the roads. In Kodikamam all the shops were closed and there were nothing but Red & Yellow flags. The same atmosphere existed in Chavakachchheri, Kaithady and Navatkuli as well. As I neared Jaffna I was able to see cars, motorcycles and bicycles with the same flag. Even in front of houses the same colours decorated the area. I wanted to take a shortcut to Tinnaveli junction by cutting through Kalviyankadu. But I had to stop within 500 metres as there was a traffic jam. The road was packed with busses and lorries carrying people who were going for the Pongu Thamil. Hence I had to take a deviation through a side road that leads to Nallur. When I reached my destination I parked the vehicle there and got a pillion ride on a bicycle to the University of Jaffna. From there it was all by foot as the roads were fully packed. The crowd was so thick at times I did not have to walk because I was virtually carried by the crowd. When I finally reached the grounds where the meeting took place I was amazed to see a large (large is not the correct adjective) crowd in it. I was speechless. I did expect a big crowd but never imagined that it would be so great. I understand that there were around 250,000 in that ground. 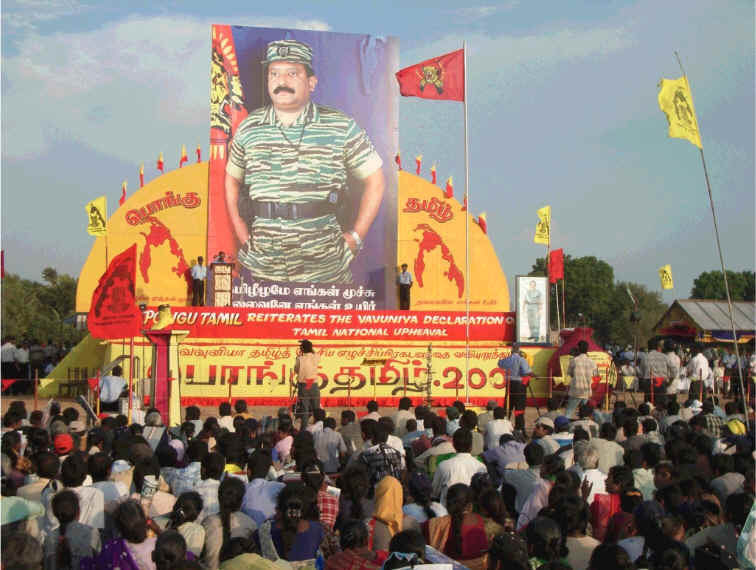 A 32 foot high cutout of the National Leader Mr. V. Pirapakaran stood majestically overlooking the crowd. There were children in Red & Yellow costume singing not only beautifully, but also emotionally. The crowd also encouraged the singers by clapping their hands and some were dancing ecstatically. Most of the people were carrying a photograph of Mr. Pirapakaran. I saw a British lady named Charlotte with such a photo in her hand as well. I asked her, "Why you are also carrying one?" She said that she was so impressed and moved to note the adoration of the people have to their national Leader, that she too wanted to have one. Easily over a hundred thousand were seated in front of the stage and the rest were standing. I felt the heat of the sun a lot despite my cap. But the people did not seem to mind it. When the speeches commenced the crowd became silent. They cheered when the speakers said something they liked. When any reference was made to Mr. Pirapakaran then the cheering pierced the skies and deafened my ears. The speakers were very well applauded during their orations. By six o�clock the sun toned down a lot and it was such a pleasant cool evening. There was enough to eat and drink, thanks to the hawkers. Peanuts and popcorn were the best sellers. I was able to note that there were, surprisingly, no police personnel or soldiers from the forces in the vicinity. I wish to point out here that the people were in such a jubilant mood they emitted pleasant and positive vibrations by their thoughts. This had very good effect on everyone present there. As the speeches progressed I felt as if I was floating in the sky. The speeches were short and crisp. I was so emotionally carried away that I must have moved away from that young man who gave me the pillion ride. I had to trudge all the way back to my vehicle. But I did not mind it because there were thousands who were doing the same thing anyway. This was the first time I have ever attended a Pongu Thamil event and I am certain that I will never miss the next one and the ones that are to follow. Participation is an experience that cannot be expressed in words.